Overview: What does the Nevada state government workforce look like? State government employees in Nevada are more highly educated than their private-sector counterparts. Nearly six in 10 state government workers have bachelor’s or advanced degrees, including three in 10 with advanced degrees. In contrast, only two in 10 private-sector workers in the state have four-year or advanced degrees (Figure A).1 Private-sector workers are also much less likely to have a high school diploma or equivalent. State government employees in Nevada are paid less than their private-sector counterparts. Adjusted for education, the pay of state employees in Nevada is 10 percent lower on average than that of private-sector workers, despite the fact that state employees are somewhat older and more experienced. Although public-sector workers typically receive more generous employer-provided benefits, Nevada state government employees do not receive Social Security coverage and the employee share of pension payments is unusually high. Therefore, the available evidence suggests that Nevada state employee benefits do not make up for the lower pay (as discussed in more detail below). Nevada has a small public sector. State government employees make up a smaller share of the workforce in Nevada (3.5 percent) than they do in the United States as a whole (4.7 percent). The federal and local government shares of the workforce in Nevada are also smaller than average. State employees in Nevada are paid about the same as the national average for state government employees ($57,818 in Nevada vs. $58,365 for the United States). Gender, racial, and ethnic pay gaps are generally lower among Nevada state employees than among Nevada’s private-sector workforce. Nevada state employees are more likely to be women but less likely to be people of color than private-sector workers in the state, though the Hispanic share of the state government workforce is growing. Gender, racial, and ethnic pay disparities tend to be lower in Nevada state government, and pay is higher in absolute (not just relative) terms for women and black/other2 workers without four-year college degrees and for four-year college-educated Hispanic workers. More-educated workers are paid less in Nevada state government jobs than in the Nevada private sector. Nevada state government employees with bachelor’s or advanced degrees earn 20 percent less on average than their private-sector counterparts (Figure B). Less-educated workers are paid more in Nevada state government jobs than in the Nevada private sector, which is disproportionately reliant on the hospitality industry. 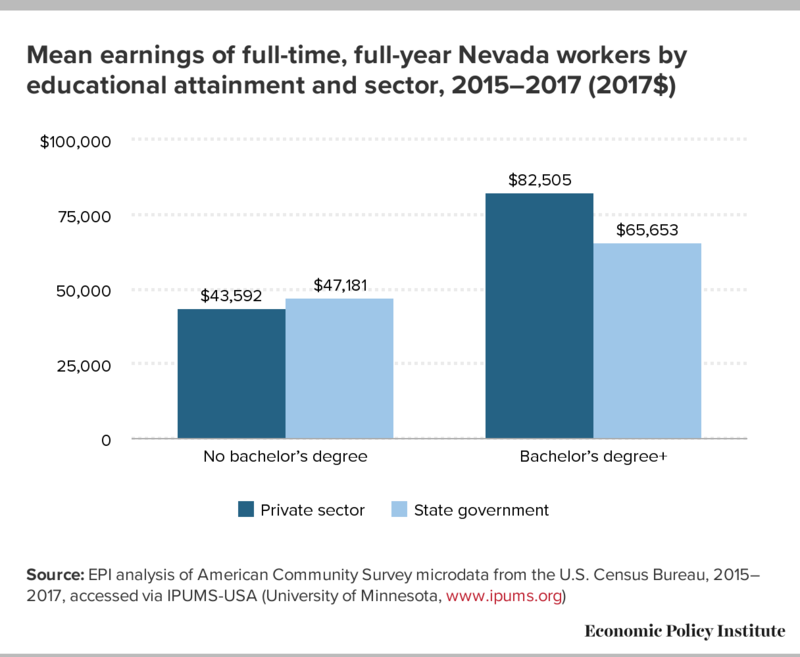 In contrast to more educated workers, workers without four-year college degrees are paid somewhat better in Nevada state government, earning on average 8 percent more than their private-sector counterparts. This is in part because many private-sector workers, including many nonunionized workers in the hospitality industry, earn less than a living wage. In addition to ethical considerations, government employers tend to have higher wage floors because these jobs are positions of public trust and responsibility. State governments also have less incentive to pay low wages because they bear much of the cost of means-tested government benefits received by low-wage workers and their families. Overall, Nevada state workers are paid less than their private-sector counterparts. Though unadjusted pay is somewhat higher for Nevada state government employees compared with private-sector workers in Nevada ($57,818 vs. $51,565), due to the state employees’ higher educational attainment, state workers’ pay is 10 percent lower after adjusting for education ($47,081 vs. $52,524). This understates the public-sector pay penalty, since state government employees are 2.6 years older and potentially more experienced than their private-sector counterparts. Do better benefits make up for Nevada state employees’ lower compensation? Government jobs generally provide more generous and secure benefits; this likely makes up for some of the difference in pay between Nevada state employees and private-sector workers. Based on U.S. Bureau of Labor Statistics (BLS) National Compensation Surveys, the employer cost of employee benefits averaged 30.4 percent of compensation for private industry workers and 36.7 percent of compensation for state and local government workers nationwide in 2015–2017 (BLS does not publish these statistics by state).3 Factoring in these estimates of benefit costs and adjusting for education, the total compensation of state government employees in Nevada is still slightly lower than that of private-sector workers ($74,426 and $75,430, respectively). However, Nevada state employees—unlike many state and local government workers—do not participate in Social Security. For this reason, BLS statistics on government employee benefits probably overstate the cost of these benefits in Nevada, since the employer’s share of Social Security contributions is normally 6.2 percent of pay. The Nevada state employee pension does replace a somewhat higher share of salary than the pensions of many other public-sector workers across the country, but the difference is not enough to make up for the lack of Social Security coverage. Nevada state employees also contribute much more toward their pensions than the typical state or local government employee nationwide. Most Nevada state employees contribute half of the total cost of the pension, much of which goes toward paying legacy costs associated with past workers. This means that the amount they contribute effectively covers most of the cost of their own pensions. In contrast, the typical state or local government employee contributes less than half the cost of his or her own pension and does not pay for legacy costs, which are mostly due to employers’ past failure to pay actuarially required amounts in full.4 In short, national statistics will tend to overstate the generosity of employer-provided benefits received by state government employees in Nevada, where benefits are relatively meager. Conclusion: State employee benefits do not compensate for lower pay and lack of Social Security coverage. All told, it is likely that state employees in Nevada receive benefits that are less generous than average for state and local government workers, factoring in the lack of Social Security coverage and relatively modest retiree health benefits. Therefore, their total compensation is lower than that of comparable private-sector workers in Nevada, especially those working for large employers who tend to provide more generous benefits, and the public-sector compensation gap is probably larger than the gap we have estimated using national benefit cost estimates. Nevada state government workers are more likely to be women. More than half (56 percent) of state government workers in Nevada are women, compared with 41 percent of their private-sector counterparts. The gender pay gap is smaller in Nevada state government than in the private sector. Women may be drawn to public service in part because pay disparities are smaller. Though women are paid less than men in both sectors, the gender pay gap is smaller for Nevada state employees, especially those with more education. Whereas women with bachelor’s degrees are paid 33 percent less than their male counterparts in the Nevada private sector, they are paid 16 percent less than men in Nevada state government. 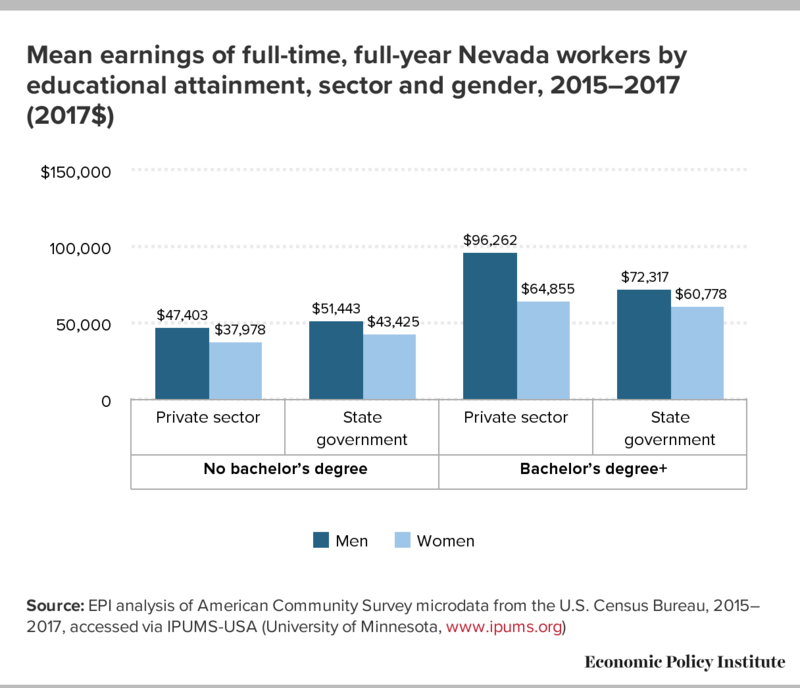 Women without bachelor’s degrees are paid more in absolute (not just relative) terms in Nevada state government (Figure C). People of color are less likely to be employed in Nevada state government than in the private sector. Whereas 21 percent of private-sector workers in Nevada identify as (non-Hispanic) black, Asian, Pacific Islander, Native American, multiracial, or “other,” and 32 percent identify as Hispanic, 16 percent of state government workers are black/other and 14 percent are Hispanic. However, state employment among Hispanic workers is growing: 23 percent of Nevada state employees below the age of 30 are Hispanic. Though people of color are underrepresented in state jobs in Nevada, racial and ethnic pay gaps are generally lower in these jobs than in private-sector jobs (Figure D). 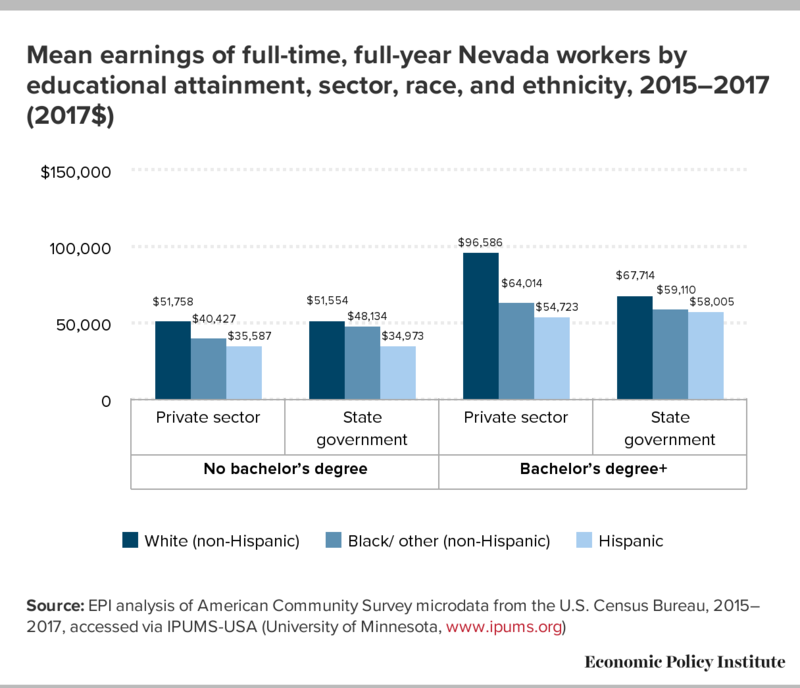 Though some highly educated people of color are still paid more in the private sector than in state government jobs, Hispanic and black/other workers without bachelor’s degrees are paid about the same or more in Nevada state government as in the private sector, as are Hispanics with bachelor’s degrees or more education. 1. Except where otherwise specified, statistics are based on the author’s analysis of 2015–2017 American Community Survey microdata provided by IPUMS-USA (University of Minnesota, www.ipums.org). Dollar amounts are in 2017 dollars. Comparisons are between full-time, full-year workers, where “full-time” is defined as working 35 or more hours per week and “full-year” is defined as working 50 or more weeks per year. “Private sector” refers to wage and hourly workers in the private for-profit sector. Education-adjusted pay controls for differences in the share of the workforce without a high school diploma; with a regular high school diploma or G.E.D. ; with some college education but no four-year degree; with a bachelor’s degree; or with an advanced degree. Adjusted pay is the average pay in each sector if both sectors had the same educational distribution as the combined workforce. 2. “Black/other” refers to workers who identify as (non-Hispanic) black, Asian, Pacific Islander, Native American, multiracial, or “other.” These smaller racial and ethnic categories are grouped together for sample size reasons. 3. Bureau of Labor Statistics, “Employer Costs for Employee Compensation, Historical Listing, March 2004 – September 2018” (set of data tables from the National Compensation Survey), 2018. 4. Author’s analysis of NVPERS plan documents accessed at www.nvpers.org, including actuarial analyses by Segal Consulting; AonHewitt, “Independent Report to the Retirement Board of the Public Employees’ Retirement System of Nevada; Independent Limited Review of Practices, Statistics, and Policies,” November 2013 (https://www.nvpers.org/public/publications/2013_independent_comparable_study.pdf); and national statistics from the Center for Retirement Research at Boston College (https://publicplansdata.org) and the National Association of State Retirement Administrators (https://www.nasra.org/publicfundsurvey). 5. For a discussion of this, see Monique Morrissey, Unequal Public-Sector Pay in Connecticut? Yes—Taxpayers Are Getting a Bargain! Economic Policy Institute, December 2016. 6. Alex Brown, Retiree Health Care Benefits for State Employees in Fiscal Year 2015, National Association of State Retirement Administrators, May 2017.